Each Contact Record includes the Bulk Email Status field. 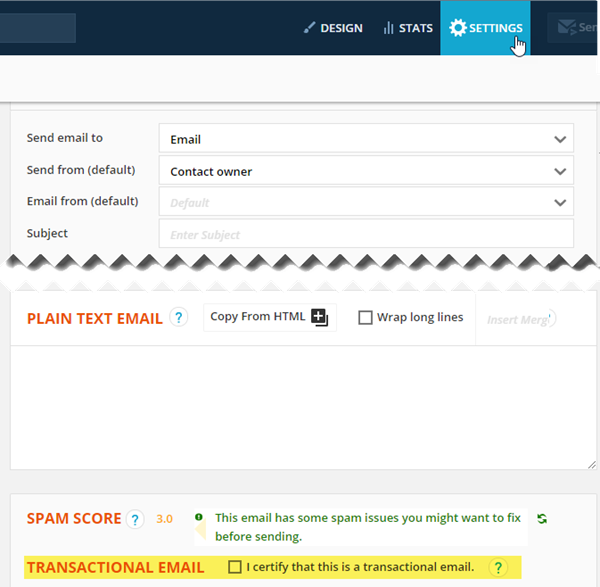 The setting in this field will determine when bulk email can be sent to the Contact. This field, along with the rest of the Contact Record, provides a method for you to prove you comply with various spam and online privacy laws. Bulk email is any email sent to two or more email addresses, and includes any email sent by automation in a Campaign, Group Action or legacy Rules or Sequences. Contacts who have opted in will have a status of either Opt In or Double Opt In. Contacts can easily opt out of receiving future bulk email by clicking the Manage Your Subscription link at the bottom the email. When they opt out of receiving bulk email the Bulk Email Status field is set to Transactional Only. They can still receive invoice receipts sent by ONTRAPORT and specific emails you indicate are "Transactional Only". Invoices - ONTRAPORT already sends invoices to clients regardless of their Bulk Email Status. You may have other non-marketing follow up to orders placed through outside systems. Paid Products or subscription content - Your clients have paid for this content, and are expecting it even if they opt out of your marketing emails. Examples are account creation, shipping confirmation and password resets. Business notices - Absolutely necessary or required notices for your existing clientele in your industry. Transactional emails must not contain any marketing information or call to action elements. You must remove any links to opt in or order forms, and remove any marketing or sales language in the email. This rule is strictly enforced. Marketing newsletters - Content intended to drive consumers to download content or encourage them to purchase a product. Marketing offers of any kind - Product offers, upsells, cross sells, downsells, content promotion, sales communication and offers of any kind. Re-engagement Emails - "We haven't heard from you in a long time. Please CLICK HERE to re-enroll in our weekly newsletter!" This is not a transactional email because it is attempting a call to action to opt in for bulk email. Postscript Marketing - "P.S. - get 25% off your next order when you mention this email!" Remove any "postscripts" or tag lines from your message that are marketing related. Be careful that your signature block does not "sell" opting in or visiting your website with marketing language. Having a link to your website is OK; having one that says "Visit our website for more offers!" is not. Upcoming offers - "Just wanted to let you know that our regular subscribers will receive special offers this coming month. Sign up if you want to be included!" This is not allowed because it is marketing language with a call to action. Remove this kind of language from your email you want to send as "transactional" email. ONTRAPORT reserves the right to review transactional email prior to sending. In most cases, the message will be automatically approved and ready to send. The email will send to all Contacts with a valid email address except those with a Bulk Email Status of "Hard Bounce". 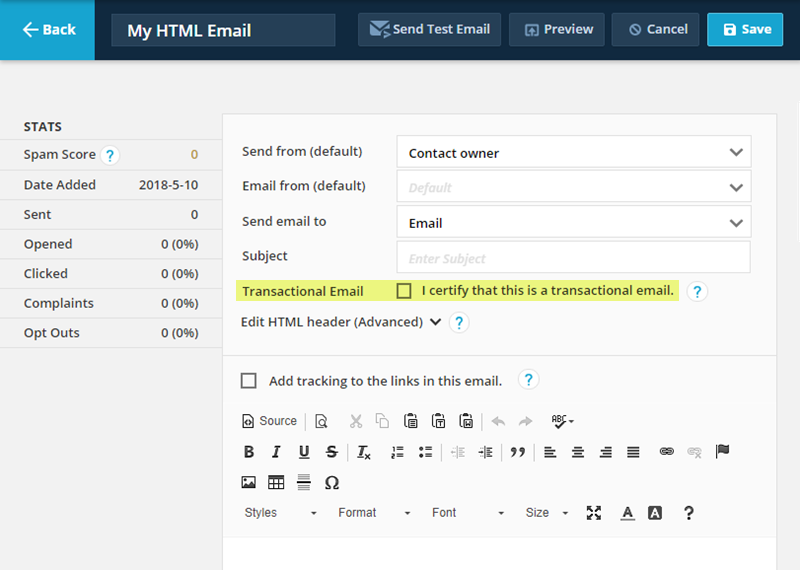 If the contact has a bulk email status of "Transactional Only" and clicks the Manage Your Subscription link at the bottom of the message they will see a slightly different Manage Your Subscription page. It will not list any Campaigns or sequences, but will include the text "You have already unsubscribed from promotional emails and you are only receiving invoices and product related emails. Please contact [Reply to Email] to stop all mailing." When you receive the return email you must act to ensure the contact does not receive future mail from you at all, including transactional email you send. You can do this by removing their email address from their Contact Record or contacting Support to have their bulk email status set to "Hard Bounce". 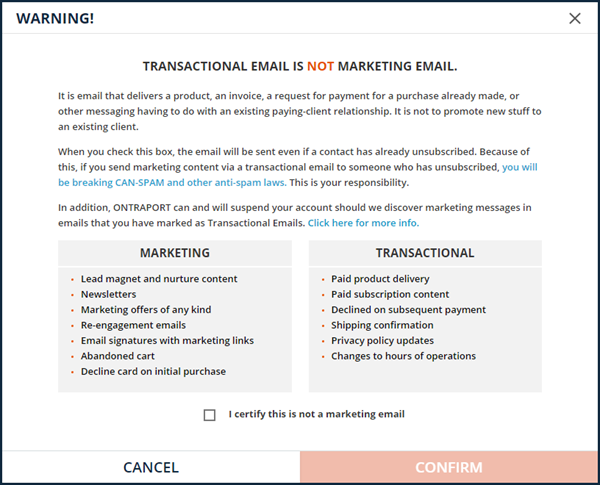 Any or all of these actions can be taken for any email that ONTRAPORT, in it's sole discretion, determines is a violation of our strict policy against promotional or marketing language sent as transactional email. If you have any questions, you can have your proposed email reviewed by our Postmaster by submitting a support ticket. In sending transactional email, you assume all liability for any violations of spam or privacy laws such as the ACMA Spam Act, CASL, CAN-SPAM or GDPR. Violations of these laws can lead to criminal charges, civil violations and fines in the millions of dollars or Euros.